Thou hast vouchsafed that all will rise again when, before Thy Passion, Thou raisedst Lazarus from the dead, O Christ God. So like children, bearing palms of triumph, we cry out to Thee, conqueror of death. Hosanna in the Highest! He cometh blessed in the name of the Lord. 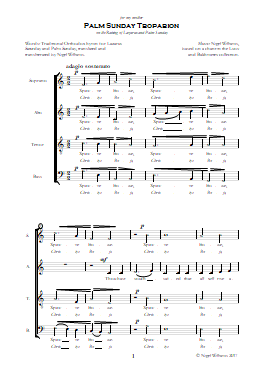 For four-part unaccompanied SATB choir, with scope for optional bass octavists.